Bankstown Airport NSW 2198 Australia. *Please note that only motions relating to matters listed on this Notice of Meeting may be considered at this meeting. *Members are reminded that they are entitled to appoint a proxy or proxies. Forms are available from the office. 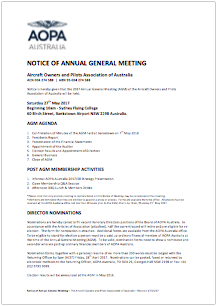 All proxies must be received at the AOPA Australia office not less than 48 hours prior to the AGM, that is by 11am, Thursday 25th May 2017. You can download the relevant Annual General Meeting documents below by clicking on the thumbnail image or the link to the right hand side. 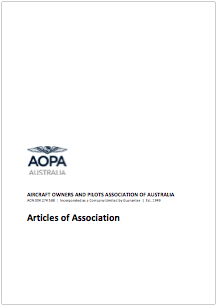 All nominations and voting are in accordance with the AOPA Australia Articles of Association. Nominations have been called to fill five (5) vacant honorary Director positions on the AOPA Australia Board close at 5pm (AEST) Friday 28th April 2017. A Nominee must be an ordinary paid up financial member of AOPA Australia at the time of the Annual General Meeting (AGM) to be eligible to stand for election and to vote. A Nominee seeking election needs to provide their nomination, a profile of no more than 250 words explaining their background and why they believe they are suitable to hold office as a Director of AOPA Australia – along with a recent passport style photograph. 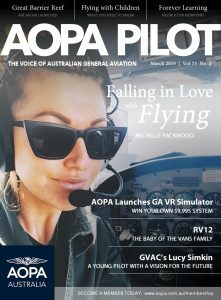 This information will be reproduced on the AOPA Australia website. To be valid, a nominee needs to be supported by a nominator and seconder who are paid up ordinary financial members of AOPA Australia. Documented and signed using the official Directors Nomination Form. 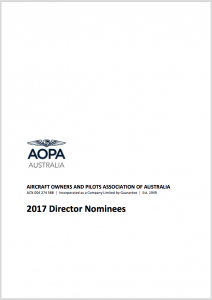 All nominations received will be published on the AOPA Australia website and by email newsletter to all AOPA Australia members on Monday, 1st May 2017. Each financial member of AOPA Australia, be they an individual or an organisation, is entitled to one vote only. Non-natural persons must appoint a proxy to exercise voting rights. Such a proxy may or may not also be a voting member in his or her own right. Dual Envelope ‘Secret’ Voting, a vote may be submitted via post using two envelopes, the outer envelope must have the member’s name, member number and signature in the space provided on the back of the envelope. The inner envelope must contain the official ballot paper with voting choices clearly marked by a cross or a tick. If more than the eligible number of candidates is marked, the vote will be rejected. Ordinary Postal Ballot must include a member’s name, member number and signature in the space provided on the official ballot paper. Postal votes must be received by the Returning Officer by close of voting at 5pm (AEST) on Thursday 25th May 2017 – PO Box 26 Georges Hall NSW 2198, Australia. Facsimile ballot papers must include a member’s name, member number, and signature in the space provided on the official ballot paper. Care must be taken not to fax the blank side of the ballot paper, as there is no way for the Returning Officer to determine the sender. To be valid, faxed votes must be faxed to the Returning Officer on (02) 9791 9355 by close of voting at 5pm (AEST) on Thursday 25th May 2017 – PO Box 26 Georges Hall NSW 2198, Australia. Email ballot papers must include the voting member’s name and members number along with the official ballot paper. Email ballots must be received by the Returning Officer no later than close of voting at 5pm (AEST) on Thursday 25th May 2017. An email confirmation of receipt of vote will be provided on receipt. 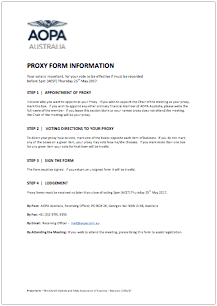 Appointment of Proxy, to appoint the Meeting Chairman or any other ordinary paid up financial member of AOPA Australia as your proxy, please complete the official proxy form and submit to the Returning Officer no later than close of voting at 5pm (AEST) on Thursday 25th May 2017. It is not a Preferential Ballot. Numbering the ballot paper in a preferred candidate order is acceptable but only if the required number or less to fill the vacancies are so recorded. Therefore, numbering your preferred candidates will have the same effect as marking with a cross or a tick. Should more than one vote from a member be received, by whatever method described above, only the first vote will be counted as valid. Once received at the Returning Officer’s office, a vote cannot be withdrawn or replaced with another vote, so please consider your vote carefully. 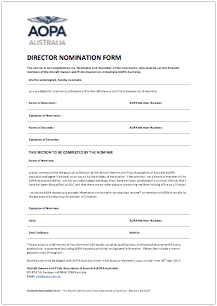 Official Directors Nomination Forms and Ballot Papers will be the only voting documents accepted and can be downloaded from the AOPA Australia website. The official forms are also be available from the AOPA Australia Head Office – call (02) 9791 9099 for more information. Election results will be announced at the Annual General Meeting, Saturday 27th May 2017. The Returning Officer shall conduct the election and make all necessary final determinations as to the conduct of the election. Game of drones: CASA releases safe flying App.